NGC 2867. Image: Hubble Space Telescope. 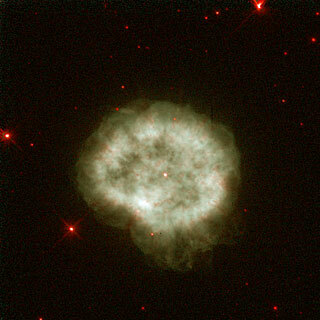 NGC 2867 is a planetary nebula in the southern constellation Carina, 1.2° north-northeast of the 2nd magnitude star Iota Carinae. NGC 2867 may be no more than 2,750 years old.1 It is unusual in being only one of a few dozen such objects known to have a Wolf-Rayet star (type WC6) as its central star. NGC 2867 was discovered by John Herschel from Felhausen observatory at the Cape of Good Hope on April Fools Day, 1834 – appropriately enough as Herschel was almost fooled into thinking it was a new planet. Its size and appearance were certainly planet-like and it was only after careful checking that Herschel was convinced it was a nebula. 1. Meatheringham, S. J., Wood, P. R., and Faulkner, D. J. "A study of some southern planetary nebulae". Astrophysical Journal, 334, 862-874 (1988).